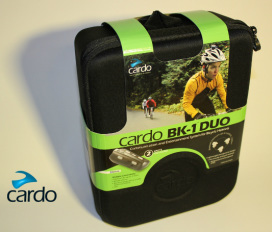 If you read Mountain Bike Industry magazines you may have seen an ad for the Cardo BK-1 and BK-1 DUO, in the likes of DECLINE MAGAZINE and others. CARDO provides Bluetooth Communication and Entertainment solutions to riders of all types, and just recently entered the cycling arena. With a rich history in the motorcycle industry, it would seem to be a natural transition to cross over into mountain bike trail riding solutions. While at the Sea Otter Classic we had an opportunity to secure a unit for testing and plan on giving it a thorough workout. We will test its features and claims: a 1640 ft, range, waterproof/dustproof, multi unit connectivity, and more. Maybe you are the fast rider in your group and you call out obstacles to those behind. Or you could be the tortoise in your group always wondering whats around the bend and how far ahead the rest of your buddies are. It would seem that being able to communicate a flat to riding partners or enjoy music while riding solo makes the CARDO BK-1 an enticing and versatile option especially if your a technogeek. Check out the specs and pricing to see if the CARDO BK-1 is right for you, and visit us in a couple weeks for our full thoughts and feedback.